Darkseid has discovered the Anti Life equation he spent a lifetime to find but has hit a snag a vital ingredient is needed - he has only to gather enough antimatter to make it a reality. Meanwhile Guy Gardner is becoming cocky with straight up heroes Superman and Stargirl. He refuses to conform to standard heroics. Even though he proves Superman wrong in a combat situation his questionable methods anger his team-mates and Guy even more so in the process... but as the three leaguers argue a giant black hole opens in space - a boom tube generated one! Arriving in Armaghetto, Apokolips, the leaguers are forced to fight almost instantly. Guy hot-headed as ever decides to battle Darkseid to get home. A fight ensues and Desaad lets slip that while they had opened a black hole to the antimatter universe he had accidentally opened a mirror black hole that had swallowed up the JLU. 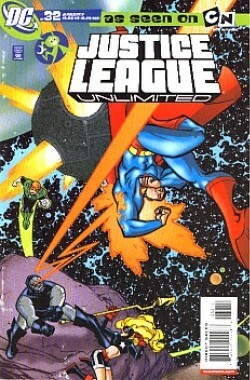 Guy decides it best to destroy the machine and does so but before Darkseid can retaliate Guy's "Super Friends" arrive. The New Gods and his fellow away team members. They threaten a terrible revenge if the peace treaty is broken. Darkseid relents and allows a battered and drained Guy to leave Apokolips. Takion however gives Guy a special gift. He awards Guy a more powerful GL ring that is part Mother Box! It allows him the ability to travel to New Genesis and Apokolips by will alone and to recharge his ring without a lantern. Superman is still a little miffed that Guy can't follow orders and Star Girl hops in between to lighten the mood. The new era of GL of the Forth World begins! Desaad questions his master and his motive for allowing the Anti Life equation to fail. Darkseid merely tells his minion that it was not the victory the heroes had originally thought and that he has the data to succeed and soon his true intentions would be revealed. But his smirkingly evil moment is destroyed with his arrival to his throne room confronted by graffiti left behind by Guy Gardner! Story - 5: Something strange has happened... continuity AND progression! And its given the title a brand new lease on life, perhaps with the end of the show the series can follow a story arc finally! Loved every second including references to the anti-monitor - it even made me like Guy Gardner and that's saying something! Art - 4: I have always hated Guy Gardner and his hairdresser should be shot but somehow he came out of this story looking pretty cool! There was nothing I would change art wise. Just keep it up gang! Cover Art - 3: A fine take on the animated style and nice to have Clark in the spotlight. It was good, just not quite up to the usual standards and perhaps too 'busy' but that's just my opinion.